For this recipe you need to start the day before as the oats soak overnight. 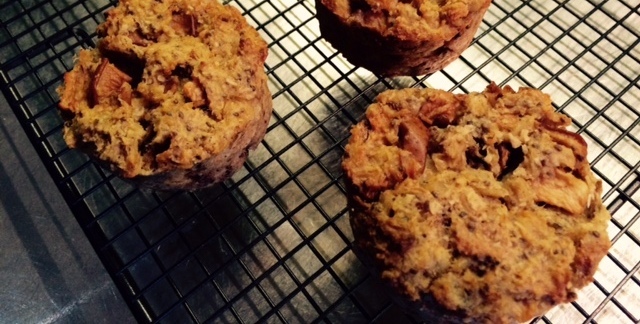 These muffins were born out of necessity and quickly became a much loved breakfast in our home. We were enjoying porridge with stewed pears but my little bub wasn’t able to feed himself the gooey stuff and relied on spoon feeding. In an effort to encourage independence (and allow myself to scoff something whilst he’s eating) I decided to turn the entire breakfast into a muffin! I strongly believe in preparing grains properly by soaking them as this makes them easier to digest. This recipe ticks that box! We love these muffins topped with natural sheep’s yoghurt and nut butter (which bumps up the protein and deliciousness) and some blueberries and stewed pear on the side. And of course a generous sprinkle of cinnamon. Place the oats in a small saucepan and add enough water to cover the oats by a couple of centimetres. Cover the pot with a lid and allow the oats to soak overnight or for at least 8 hours. Cook the oats on low heat until nice and creamy, stirring often to prevent the bottom from burning. The oats will cook through in about 5 minutes, as the soaking process would have softened them. Leave the cooked oats in the pot to cool down, transfer to a mixing bowl and place in the fridge, until they clump together and ‘set’. This step is important, as it will prevent the muffins from being too moist. Remove oats from fridge. Add in the desiccated coconut, chia seeds, cinnamon and baking powder and mix to break up the oats a little. In a separate bowl whisk the egg, coconut milk, macadamia oil and vanilla essence. Add this to the oat mixture and mix thoroughly to combine, squishing any large clumps. The batter will be moist. Fold through the pear. Divide the batter across a 12-hole muffin tray, tightly packed. I like to use a silicon tray as the muffins slide out with ease. If you have a metal tray, it’s a good idea to line the holes with paper baking cups. Bake for 35-40 minutes, or until fgolden on top. Remove muffin tray from oven and to cool slightly. Then remove muffins from muffin tray and allow them to cool completely and set on a cooling rack. Store in the fridge in an air tight container for up to 3 days or freeze.